SEO is a long term game and it’s very misunderstood. A lot of people think that SEO (search engine optimization) is tweaking a few things here and there, changing some links, and hiring a coffee addicted intern in a basement somewhere to do the rest. Over the next few posts we are going to deconstruct SEO for you into bite-sized pieces, and at the end of this thing it will all make sense to you, I promise. We will also guide you with specific techniques and tools to use to become an expert in SEO, and bring your business to the next level. 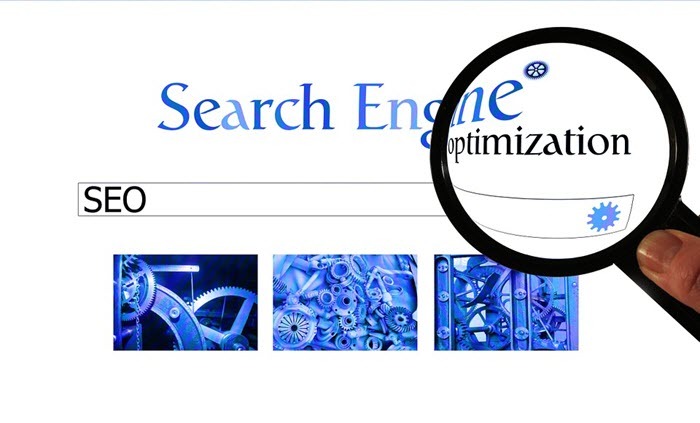 Search Engine Optimization is how the web reads and categorizes your website. There are little friendly robots that scan your site and categorize all of your content based on what people search for online. Keywords are words and phrases that make your site searchable online. When you think of potential keyword you have to think about your potential customer. Let’s say you are a pet shop, and you put all your effort into ranking highest for specific brands. Well that’s all well and good, but your customer might be searching for things like “cheapest dog food in New York” and not the specific brand of dogfood that you are ranking for. So you need to broaden your keywords for that. A lot of people think they should go after the keywords with the highest traffic first. The problem with that is that they end up competing with a lot of other sites, after all they are going after the keywords that are hardest to rank for! 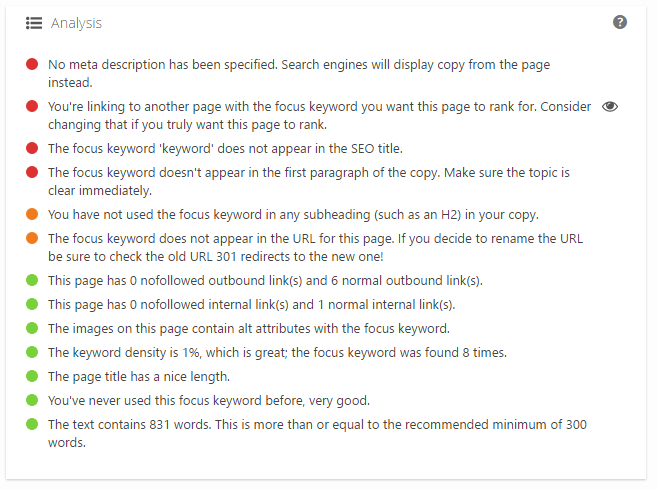 Kissmetrics, argues that the best strategy is to have 80% of your content use the less popular keywords, with low search volume, and then you will out compete the sites that only target the highest searched for keywords. The best tool to use is Google Adwords Keyword Planner tool, which allows you to search for any keyword and see the traffic for it. It also lists similar keywords and phrases that you could pick from. 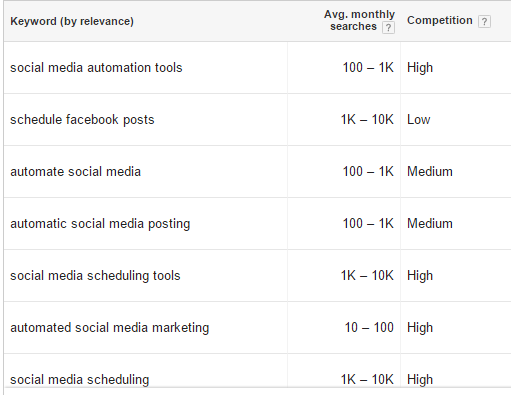 Out of that list the keywords with the lowest competition are “schedule facebook posts” and facebook automation”. Now I can go to my content drawing board and write articles that target these specific keywords. I will be more successful and will rank higher on Google if I focus 80% of my content on the low hanging / low competition keywords. Check out this SEO keyword tool list to learn about other tools. Where do these keywords go? 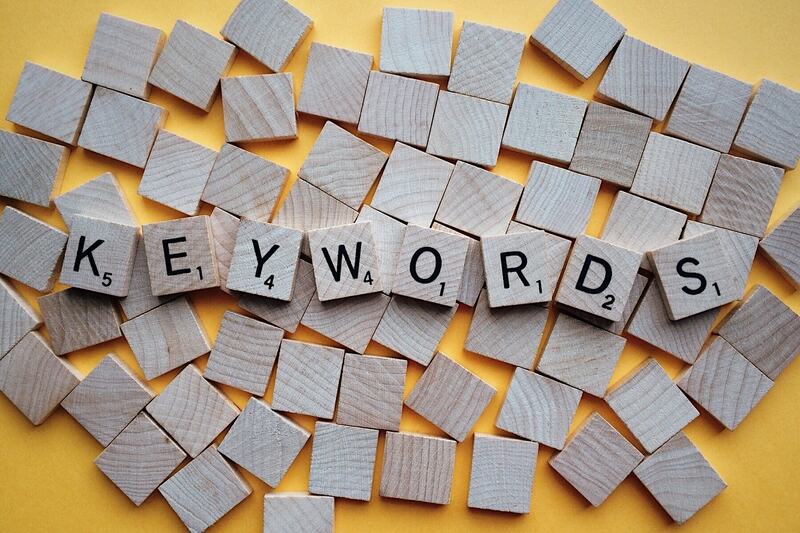 Now that you know where and how to pick the most relevant keywords, where do you put them? This is super simple. There are a few spots on your website where the keywords are needed the most for the search engine creepy crawlies to find them. Use keywords in your post title – Putting the keyword in the title is key. This will help your article get ranked for that keyword. Put keywords in your headings – Make sure that your blog post has good clear headings, and then put some keywords in there. It will not only make it easier to read and follow but also will help with your SEO. Put keywords in your linked texts – Google ranks linked text higher than regular text. So the best way to do this is to make a link to your own article that discusses a similar subject or to a popular guide on that subject and then describe it using your keyword or phrase. One of the best tools to improve SEO is Yoast. It’s a simple WordPress plugin that ranks every page and piece of content and tells you specific things you need to change to improve the search engine ranking of your content. Here is a screenshot of what my Yoast is telling me as I’m writing this article. All the green items are good, leave as is. Red and yellow are things that need improvement. For example, I need to write a meta description for the post as well as choose a keyword that will appear in the title of the post. Now, there are two ways to write content. The first is to write for the search engine, and the second for your audience. If you use the first then your content will turn out boring and no one will want to read it. If you only use the second method then you might not rank as high and your content will be harder to find. So what’s the solution? Write every piece of content with your audience in mind, offering value, solving a business problem, listing important tools and tips, and then spruce it up with some keywords. Searching for the right keyword can help you zero in on your topic but don’t make the whole article google-friendly instead of reader-friendly. For more reading about SEO check out our 30 Day SEO Challenge. Hello very nice web site!! Man .. Excellent .. Superb .. I’ll bookmark your website and take the feeds additionally? I’m happy to seek out a lot of helpful info right here in the submit, we need work out extra techniques on this regard, thanks for sharing. . . . . .
Hi! I simply want to offer you a big thumbs up for your great info you have right here on this post. I will be returning to your blog for more soon. We stumbled over here coming from a different page and thought I should check things out. I like what I see so now i’m following you. Look forward to going over your web page yet again. Superb blog! Do you have any suggestions for aspiring writers? I’m hoping to start my own site soon but I’m a little lost on everything. Would you propose starting with a free platform like WordPress or go for a paid option? There are so many choices out there that I’m completely confused .. Any ideas? Bless you! Thanks for your marvelous posting! I genuinely enjoyed reading it, you can be a great author.I will make sure to bookmark your blog and definitely will come back sometime soon. I want to encourage that you continue your great job, have a nice evening! Hi, I do believe your blog might be having web browser compatibility issues. When I look at your site in Safari, it looks fine however, if opening in I.E., it has some overlapping issues. I just wanted to provide you with a quick heads up! Besides that, great website! When someone writes an article he/she retains the image of a user in his/her mind that how a user can understand it. Thus that’s why this article is amazing. Thanks! If you desire to get a good deal from this paragraph then you have to apply such strategies to your won webpage.